In large bowl, mix flour, sugar, cocoa, baking powder and salt until blended; make well in center of mixture. In medium bowl, stir coconut milk, butter and egg; pour into well in dry ingredients, stirring just until moistened. Stir in chocolate chips and 1 cup coconut. Divide batter evenly among muffin cups. Bake 18 to 22 minutes or until toothpick inserted in center comes out clean. Remove from pan to cooling rack. Cool in pan on cooling rack 15 minutes. 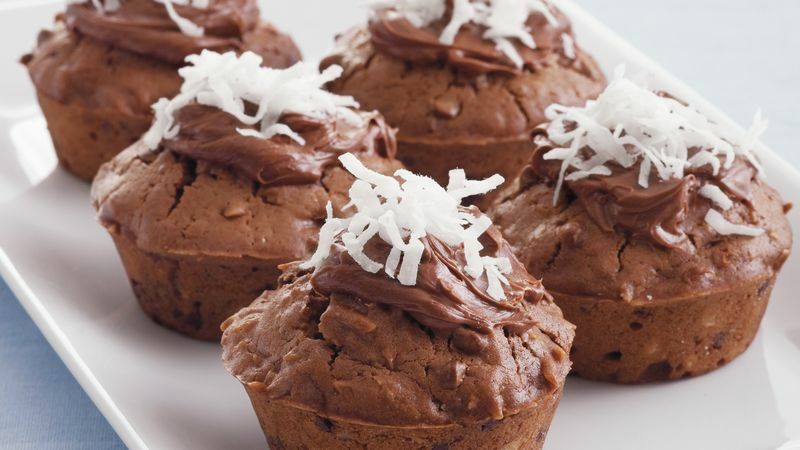 Spread muffin tops with frosting; sprinkle with additional coconut.